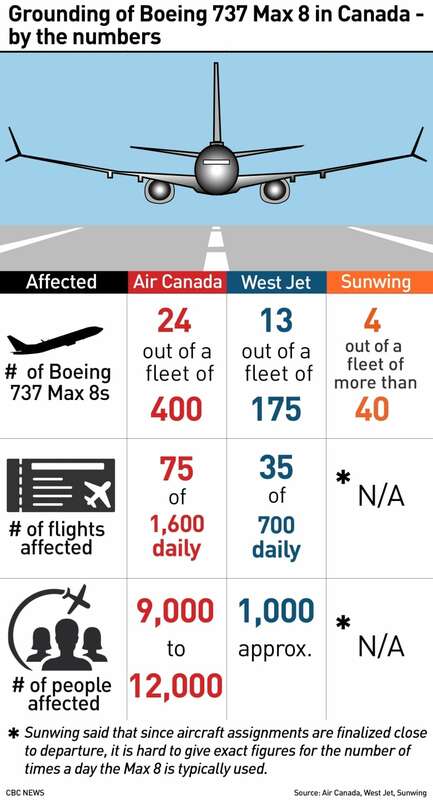 Boeing has grounded its entire fleet of 737 Max aircraft in a move expected to cause significant disruptions for domestic airlines now forced to scramble to rebook thousands of Canadian passengers. "The significant problem now is that this is March Break," said David Gillen, director of the Centre for Transportation Studies at the University of British Columbia. "So you're going to take a real significant problem exacerbated by a significant factor." Air Canada has 24 Max 8 aircraft, WestJet Airlines Ltd. has 13 Max 8s in its fleet, while Toronto-based Sunwing Airlines Inc. has four Max 8 aircraft. Following moves by Canada, the U.S. and most other countries to ground the planes, Boeing grounded its entire fleet of 737 Max aircraft late on Wednesday. 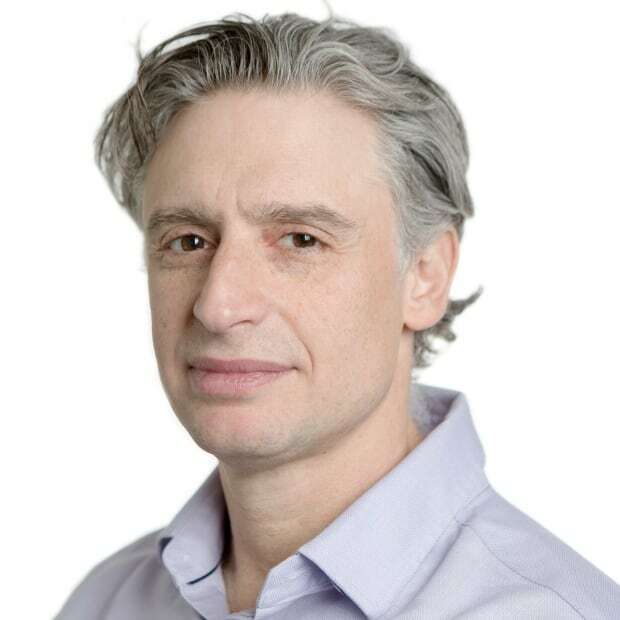 "Nowadays, there simply is not really spare capacity, and most airlines are flying full," said Fred Lazar, a York University economics professor. Peter Fitzpatrick, a spokesperson for Air Canada, said the airline was looking into accommodating customers on other airlines. He said it had rescheduled widebody aircraft to serve Hawaii, while some flights will operate according to schedule with Air Canada Rouge planes or other aircraft. Other routes, notably Halifax-London and St. John's-London, are cancelled in the short term, with passengers rerouted through Montreal and Toronto hubs, he said. "Given the magnitude of our 737 MAX operations which on average carry 9,000 to 12,000 customers per day, customers can expect delays in rebooking and in reaching Air Canada call centres." Meanwhile, WestJet said it was "swapping aircraft and making flight changes to accommodate as many people as possible." Around 1,000 passengers had been affected, the company said, and half were moved to same-day flight options with the remainder to be recovered Thursday and Friday. "This decision has an impact on the travel plans of our WestJet guests and we ask for understanding as we work to rebook all guests affected as quickly as possible," Ed Sims, the CEO of West Jet, said in a statement. For Canadians, taking those planes out of operation means the frequency of flights on some routes will invariably decline, Lazar said. "It will be very difficult to accommodate many of those passengers on flights within the timeframe that they desire." Mike Doiron, a New Brunswick-based aviation expert, said the challenge to airlines is finding planes to replace their lost fleet. "If they are able to get airplanes, the passengers probably won't even notice anything. If they are unable, then that's a whole different kettle of fish. "It's not like going out and renting a car." Lots of companies lease airplanes, but most of their planes are already on leases, he said. "There's no parking lot where they have a whole bunch of these airplanes just sitting there waiting to get picked up." "I would imagine the airlines will start looking very seriously at 'where do we get more airplanes of the type that we already have on a short term lease?' They do have options. However they're very limited." Bringing in planes for domestic use from outside of Canada can be an onerous task. "The fact that [an] airplane is registered outside of Canada, they would have to jump through a whole bunch of hoops and regulations and inspections and maintenance verifications prior to them letting that aircraft fly," Doiron said. 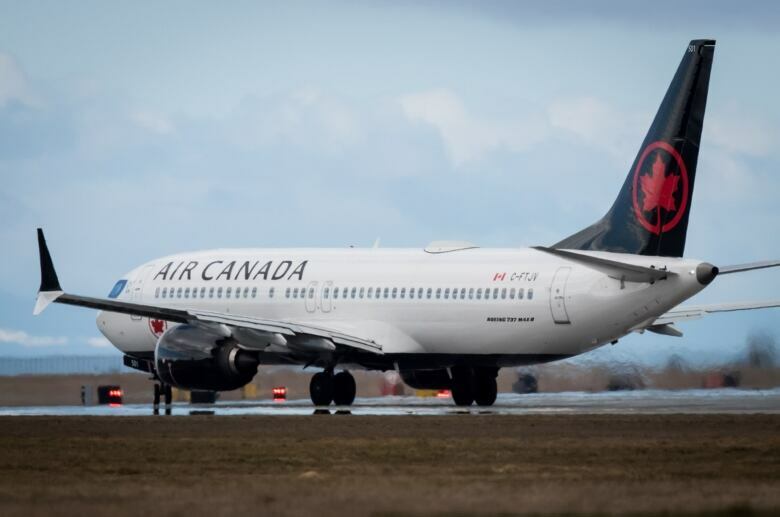 Meanwhile, some of the passengers on the 737 Max 8 who arrived on Wednesday at Toronto Pearson International Airport just as the grounding was announced, said they had no apprehension about flying on the aircraft. "I fly all the time. It didn't really bother me," said Steve Giles of Edmonton. "I will likely have a delay, I go back Friday. We'll see what happens." He said he believed the government made the right call in grounding the plane. "They know better than I do. It's better safe than sorry." Chris Power from Halifax said she agreed with the decision to ground the plane but also wasn't worried about getting on the Max 8 before flying to Toronto. "I'm such a seasoned flyer, I was ok. I didn't figure we'd take off if it wasn't safe."